Helen Rachel Slater (born December 15, 1963) is an American actress, singer and songwriter. She played the title role in the 1984 film Supergirl, and returned to the 2015 TV series of the same name, this time as Supergirl's adoptive mother. In the following years, she starred in several comedy-drama films such as Ruthless People (1986), The Secret of My Success (1987), and City Slickers (1991). She additionally found work as an actress in television, and stage projects, including three guest appearances on the series Smallville (2007–2010). She was a series regular for the two-season run (2011–2013) on the ABC Family series The Lying Game. In the 2000s, Slater recorded five albums, singing her own compositions and playing the piano. Slater was born in Bethpage, New York, to a Jewish family. Her parents, Alice Joan (née Citrin), a lawyer and nuclear disarmament peace activist based in New York City, and Gerald Slater, a television executive, divorced in 1974. She has a brother, David, who is a lawyer in New York City. Slater attended Great Neck South High School and then transferred to the High School of Performing Arts from which she graduated in 1982. Despite common misconception, she is not related to actor Christian Slater, who played her brother in The Legend of Billie Jean. Slater made her acting debut in the ABC Afterschool Special Amy & the Angel, aired in 1982, alongside James Earl Jones, Meg Ryan, and Matthew Modine. This was also the only film she appeared in exclusively as a brunette. In 1984, she played the title character, versus Faye Dunaway as Selena, in the TriStar release Supergirl. The film, directed by Jeannot Szwarc and including big name actors like Mia Farrow and Peter O'Toole, received mixed reviews, and was not a box-office success. The film was cited as a reason for publisher DC killing off the original comics character (Supergirl (Kara Zor-El)) in 1985, though a new "Supergirl" soon appeared. Slater's performance was not generally blamed. In her next film, Slater was cast alongside Christian Slater and Yeardley Smith as Billie Jean Davy, a folk hero who styles herself as a modern-day Joan of Arc, in the film The Legend of Billie Jean (1985). Next, she appeared in two high-profile comedies, Ruthless People (1986) and The Secret of My Success (1987). More high-profile roles followed when she appeared in the independent comedy Sticky Fingers (1988) with longtime friend Melanie Mayron, City Slickers (1991) with Billy Crystal, the steamy A House in the Hills (1993) with Michael Madsen, and the action-crime drama No Way Back opposite Russell Crowe (1996). Other noteworthy performances were seen in films including 12:01 (1993), Betrayal of the Dove, and opposite Andy Richter in Seeing Other People (2004). Slater has appeared on episodes of various television series, including The New Adventures of Old Christine, Supernatural, four episodes as the voice of Talia in Batman: The Animated Series, and others. She was a series regular on the half-season run of the 1990 ABC newsroom drama Capital News and the 2011–2013 two season run of the ABC Family series The Lying Game. During her career, Slater has revisited her 1984 role of Supergirl. She made a brief guest appearance on Seinfeld as a love interest of Jerry Seinfeld, who in reality is a huge fan of Superman. Slater was seen in a recurring role as Clark Kent's biological mother, Lara, on the TV series Smallville and as Supergirl's adoptive mother in the TV series Supergirl. Slater was a spokeswoman for Preference by L'Oréal in both television and print ads. Slater co-founded the New York theater group, The Naked Angels, with Gina Gershon. Her stage credits include appearances in Grease and Shakespeare and Friends. Off-Broadway, she starred in Responsible Parties and Almost Romance. She also attended classes at both N.Y.U. and U.C.L.A., to broaden her acting abilities. Slater has stated that she pursued musical efforts even before doing movies. In the 1989 Patrick Dempsey romantic comedy Happy Together, she sang a medley of Broadway songs as well as other songs. In the 1994 movie Lassie, she also sang. For the soundtrack of the film Nowhere In Sight (2000), she contributed the song "The Detour." In 2003, she released a CD, One of These Days, consisting of her original songs. The tracks were real-time recordings with Slater singing and playing piano, accompanied by six other musicians; no multitracking, editing, or dubbing was employed. In 2005, she released a second CD, Crossword, which used the same recording approach as the first CD. Both albums were produced by Phil Swann. In 2008, Cortes Alexander recorded Slater's "Any Day Now" and "Love'll Come & Do Just That" on his album Swell. Her third album, Shine, was released in 2010. In 1985, DC Comics named Slater as one of the honorees in the company's 50th anniversary publication Fifty Who Made DC Great for her work on the Supergirl film. In 2010, Slater wrote a Supergirl story titled "A Hero's Journey" which appeared in the fiftieth issue of the fifth volume of the Supergirl comic book. 1982 ABC Afterschool Special Amy Watson Episode: "Amy & the Angel"
1991 The Hidden Room Lauren Episode: "Wasting Away"
1992 Seinfeld Becky Gelke Uncredited; episode: "The Good Samaritan"
1992 Dream On Sarah Episode: "Theory of Relativity"
1992–1994 Batman: The Animated Series Talia al Ghul (voice) "Off Balance"
"The Demon's Quest, Part 1"
"The Demon's Quest, Part 2"
1997 Caroline in the City Cassandra Thompson Uncredited; episode: "Caroline and the Monkeys"
2001 Will & Grace Peggy Truman Episode: "Moveable Feast"
2003 Boston Public Mrs. McNeal Episode: "Chapter Seventy-Four"
2004 Law & Order: Special Victims Unit Susan Coyle Episode: "Families"
2005 Grey's Anatomy Nadia Shelton Episode: "Grandma Got Run Over by a Reindeer"
2007 Crossing Jordan Elaine Tallridge Episode: "Seven Feet Under"
2009 Supernatural Susan Carter Episode: "Family Remains"
2009 Eleventh Hour Susan Wynne Episode: "Medea"
2009 Greek Dr. Magda Stephanopoulos Episode: "Guilty Treasures"
2010 CSI: NY Elizabeth Harris Episode: "Do Not Pass Go"
2011 Private Practice Erin Episode: "Two Steps Back"
2011 Drop Dead Diva Penny Brecker Episode: "Hit and Run"
2014 Caper Luke's Mom Episode: "All Hands on Peltas"
2015 Mad Men Sheila Episode: "Person to Person"
2015 Agent X Helen Eckhart Episode: "Fidelity"
2015 DC Super Hero Girls Martha Kent (voice) Web series, episode: "Welcome to Super Hero High"
^ Pantozzi, Jill (2009-12-07). 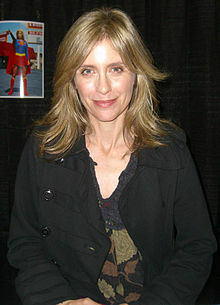 "Helen Slater is Still "Super"". Comic Book Resources. Retrieved 2010-10-09. ^ "60 SECONDS: Helen Slater". Metro. Retrieved 2010-10-09. ^ Gelder, Lawrence Van (1985-03-03). "Long Islanders; a 'supergirl' Continues to Live up to the Title". The New York Times. ISSN 0362-4331. Retrieved 2018-01-27. ^ Clark, Krystal (2015-01-22). "Exclusive: Helen Slater reveals how she became the 1st Supergirl, talks CBS reboot". Syfy. Archived from the original on 2018-01-27. Retrieved 2018-01-27. ^ Hunter, Rob (August 7, 2014). "28 Things We Learned from 'The Legend of Billie Jean' Commentary". Filmschoolrejects.com. Retrieved November 23, 2015. ^ Saporito, Joseph R., Cortés Alexander, Thou ‘Swell’, qmetropolis.com, March 18, 2009. "My Dinner with Supergirl", People magazine, December 3, 1984, Vol. 22 No. 23; interview with Helen Slater, on newsstands during Supergirl's U.S. release. This page was last edited on 25 March 2019, at 23:29 (UTC).